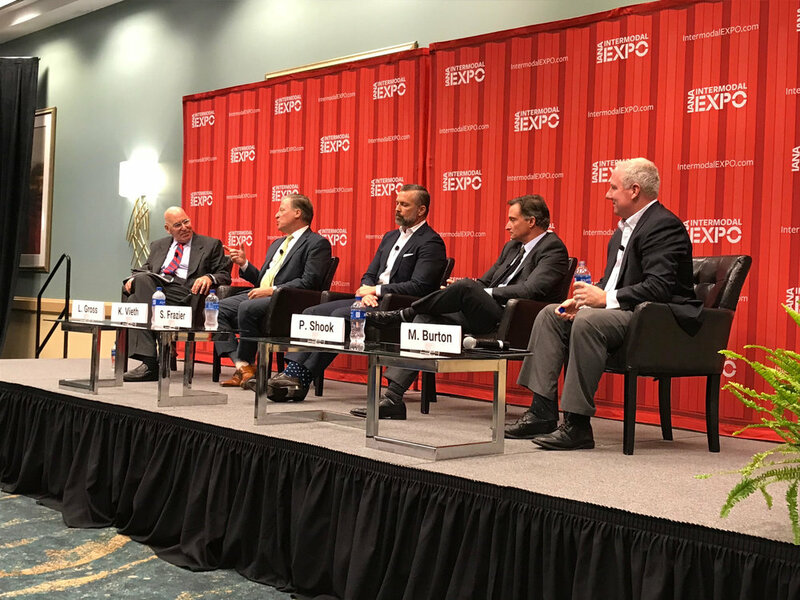 With so much focus on retaining and recruiting new drivers, several panelists on the first day of the industry's leading intermodal conference said implementing improved productivity could accomplish the same significant increase in capacity that a boost in the number of drivers would provide. As Mike Burton, president of C&K Holdings said, he had been in an earlier meeting at the Intermodal Association of North American annual exhibition in Long Beach, California when somebody described the situation the industry is facing. Burton said his colleague said the industry does not have a driver shortage problem. Rather, he said, "we have a productivity problem. And if we get that solved, we don't need to hire more drivers." Burton and a panel of four others appeared at a panel at the IANA annual exposition entitled "Is Trucking Capacity at a Crossroads?" Phil Shook, a director at 3PL C.H. Robinson (NASDAQ: CHRW), said the decline of productivity "is the big wild card in the industry." Improvement in productivity measures that could include better use of telematics to steer around traffic issues, or improvement in the drayage part of the intermodal equation, could be utilized to squeeze out "another half a load a day." It doesn't sound like much, Shook said, but the impact of that would be enormous. With the C&K president on the panel, the topic of drayage was front and center. C&K is a 100% drayage carrier, and the landscape it faces for drivers is not the same as an over the road carrier. Their drivers are inevitably home every night. While long stretches on the road are a factor in hiring drivers into the truckload space, that is not the case in drayage. Still, it's not as if the industry faces a surplus of drivers, according to Burton. Burton estimated the size of the drayage driver pool at about 400,000 drivers. The company's research indicates that about 20-25% of the drayage drivers that the company loses each year leave the industry completely, and that drayage--like other driver sectors--are losing people to construction and manufacturing. It's similar to 2006-2007, Burton said, but C&K sees no end to it. "If you look out over the next two years, we see that trend continuing," Burton said. And productivity comes into the equation. "We see that in each market we're in, where we see productivity issues, we lose drivers and then it's harder to get them back," Burton said. "And where we see improvements in productivity it's a huge factor to increase capacity and retain drivers." One issue is starting to take care of itself, according to Shook: pay. Rates in the drayage sector, which was described as having lagged even further behind inflation than other driving activities, are "getting closer to where drivers are being able to make a living wage, reinvesting in their truck, have a family and pay their bills," Shook said. Pay rates in the intermodal space have been "suppressed for so long" that it may take several years for them to catch up to other driving segments, he added. Burton bemoaned the fact that making productivity changes in the drayage sector is limited by the fact that "it's tied to productivity outside our control." Drayage companies can't do much about the productivity in rail yards or in the ports. "We can do a great job with retention but if there is a shortage of chassis and you can't move stuff for one to two weeks, the driver's wife gets upset and tells him to start looking for another job," Burton said. But Burton said that he's been impressed with the improvements the other parts of the port activity have made. But still, given the surge in demand, he only gave that sector a grade of C minus. New truck supply: Ken Vieth, the president of ACT Research whose monthly numbers on new truck orders are closely watched, noted that the last three months, new orders for class 8 vehicles were running at an average rate of 700,000 units. In the prior seven years, the average rate had been running at 265,000 trucks per year. While the need to have a fleet of new trucks as a driver retention tool has often been cited as the reason behind these eye-popping numbers, Vieth said the improved fuel economy is a big reason for the buying frenzy. In the 2014-2015 model years, Vieth said, fuel economy was about 8 mpg. But that has moved up to 8.5, and is far above the levels of 6-7 mpg of several years ago. Burton noted that the drayage sector was not buying new trucks; it was the market for the used vehicles. He said there is a lot of idling time with old trucks that get lesser mileage, "so there is room for improvement. But it's not as much as you're seeing the truckload guys get now." Productivity on the consumer end: The issue of productivity was not simply focused on what carriers would do for improvement. As Shook noted, drivers today have their choice of where they want to haul freight. "They don't want to go to places where they're not going to be treated with respect," Shook said, noting that drivers were not looking for anything "extravagant." Instead, they want "basic human comfort." C.H. Robinson shares data with their customers on how long it takes drivers to get in and out of their particular site. That helps, he said, but the shippers aren't the origination spot in the supply chain; the shippers' vendors "are more difficult to control,” Shook said. Regardless, the supply chain still needs to deal with the fact that, as Shook said, "every day a driver says, 'I'm not going to X.'" That isn't a short-term phenomenon, Shook said: "I think it's going to stick." State of the market: It's been great, everyone agreed. But the first-half gains in volume and rates are probably in the process of leveling out. Spencer Frazier, the senior vice president-sales at J.B. Hunt (NYSE: JBH) , said pricing is beginning to become more aligned with capacity, "and now we've seen a bit of a balance." But Frazier said demand still looks strong. An informal show of clapping--as opposed to a show of hands--indicated the audience believed the market would be even stronger at this time next year.